Although I have seen the Divine Mother previously, there was nothing like this moment. Waiting on the queue to receive my embrace of the Divine Mother in her expression of her Devi Bhava I was struck with a terror that penetrated to my very core. The conch shell was blown creating an atmosphere of antiquity. No longer was I standing in a large hall, but was now occupying a space that was imbedded in Sacred Time itself. To step out of a mundane space and enter into a Divine space without even taking a single step. The conch shell blew on. The chanting of vedic mantras began in front of the Holy Mother. The words of the vedas in human form. Now no longer the simple village girl, but now, dressed in clothing prepared by the devas themselves, stood before us all the Goddess Kali Herself. How it was possible for my terror to increase I do not know, but frozen I sat in an uncontrollable tremble. The thought, “Run away” “execution line” were swirling in my mind as if a new mantra had uplifted from the depths of my being. Taking Her seat at Her throne, Kali Ma sat. The queue opened. I was beckoned to move forward. Standing up I realized I could not take a step. Frozen in place was I. Who would willingly walk to the gallows? If it was not for my beloved partner sitting beside me I would have run away. Giving away my token to someone who had not the opportunity to get one. An act of selflessness disguised as an act of selfishness. To receive mantra diksha was why I was on the queue. Although, at that instant every aspect of Advaita philosophy sprang up from within me. “You are God here and now, why do you need a mantra?” “If Truth is present now, what can a mantra do?” “To be a spiritual seeker is to hold on to an “I” that is seeking.” If every thought that passed through my mind at that instant was recorded volumes upon volumes of eastern philosophical thinking would have been produced. All for what purpose? To merely justify running away. Yet, the line was moving and the chance to run away had passed. Already by the stage I stood. As I got closer to the stage I tried to keep myself calm amongst the tussle and noise of the thousands present. “Just say ‘Mantra please’” I kept reminding myself lest I forget to even ask for a mantra and have to go through the entire process again. Before I knew it it was my turn to be embraced. We hear in stories and myths of antiquity of men and women interacting with and communing with the gods and dismiss them as mere stores from a “primitive” mindset. Yet, are not the great saints and sages of the past hundred years till now on the same plane? That which you call Krishna and Shiva is none other that a name for your own very self. That which you call Krishna and Shiva is none other that a name for the one you see before you. That being as it is, are we not fully surrounded by gods and goddess here and now? 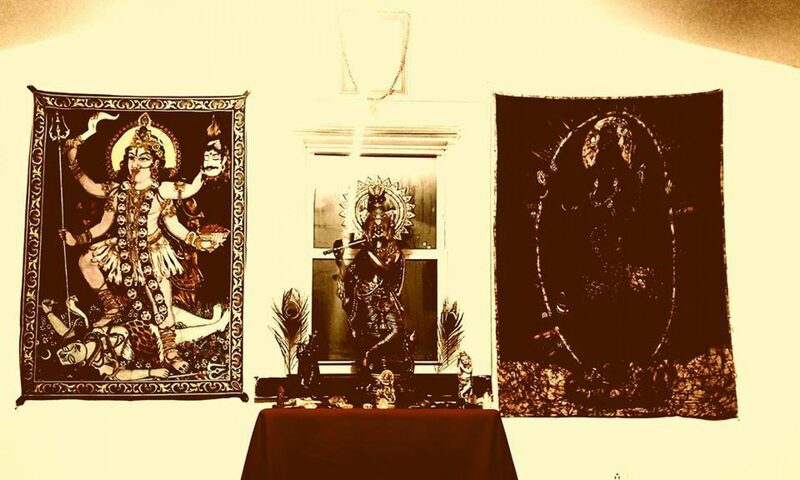 What is it like to be in the presence of Goddess Kali Ma? Like a drowning man gasping for air, or someone born dumb and unable to speak. Before the Holy Mother all are mere particles of dust not yet worthy to collect on Her sari. Despite this, we are accepted into the universal arms. It is often said of this experience that time itself stands still. The external world evaporates and you are left alone before the very source of your being itself. In actuality, while in the embrace we discover that time and the world of externals was merely a projection of her being. In the moment of embrace, we are not given a new mystical experience. We are merely brought back to the natural state that is the birthright of us all. In my hand was a card with the word “mantra” on it. Although I do not remember speaking, somehow my message went through and I was to be able to receive the sacred sound. Leaving the stage I was led with a group to have explained to me the nature of the mantra and the type of mantra we can receive. In the Mother’s great compassion, we can choose the conception of Divinity we wish to embody. It was at that instant my entire world shattered. I was brought off the stage, but was unable to speak. Thoughts were not able to come. The very idea of thoughts themselves seemed laughable. The idea that we could trick ourselves into being anywhere other than where we already are; what a game, what a prank indeed. The years followed where I faithfully continued the practice given to me by the Holy Mother. That fateful “moment” happened while attempting to mediate. I moved closer to my altar and merely closed my eyes. I was neither meditating or not meditating. I was just sitting there. Without any special sign or warning, suddenly it became increasingly clear that everything is of the nature of the Divine. That everything is literally God. The soap in bathroom. My strands of loose hair. The meditation seat itself, the mala used during meditation, is none other than God. What was said throughout the ancient scriptures from time immemorial: “Tat Tvam Asi” “That Thou Art” is pointing not to some state to be gained in the future, but to what you already are.